My Grandfather has a tie. This is a very special tie. It was given to him by his true love. In all of my experiences with them together I never saw anything but unconditional love from my grandfather toward my grandmother. She has since passed on and is now in heaven making sure all things are in order, that everyone is using correct grammar, and overseeing the flowerbeds. I noticed this special tie at my sister’s wedding. The entire family was outside the temple waiting for the couple. I approached and told him that I liked his tie. He thanked me, smiled and in true Grandpa Ralph fashion, began to teach. He taught me that each Scottish clan had their colors or specific plaid pattern that they would wear. It made me think of flags or banners used in war – individual titles of liberty, if you will. Everyone knew who you were and to whom you belonged based on the colors you wore. He was wearing his prized McIntosh plaid tie. My grandmother was a McIntosh… and you knew it… red hair and all. She had given him the tie. Grandpa continued to tell me that he wore this tie on special occasions when he thought that Grandma would have liked to be there (such as weddings and baptisms).2 He joked that the only problem with the tie was that most of the family thinks that he only owns one tie. He continued, still in true Grandpa Ralph fashion, now to apply his lesson on Scottish history to me. He asked me my middle name. Its Sam. He asked me where I got my middle name. He reminded me that I am named after a great man. A McIntosh. And that the colors that he was wearing, are my colors too. I received a package in the mail 4 days ago. 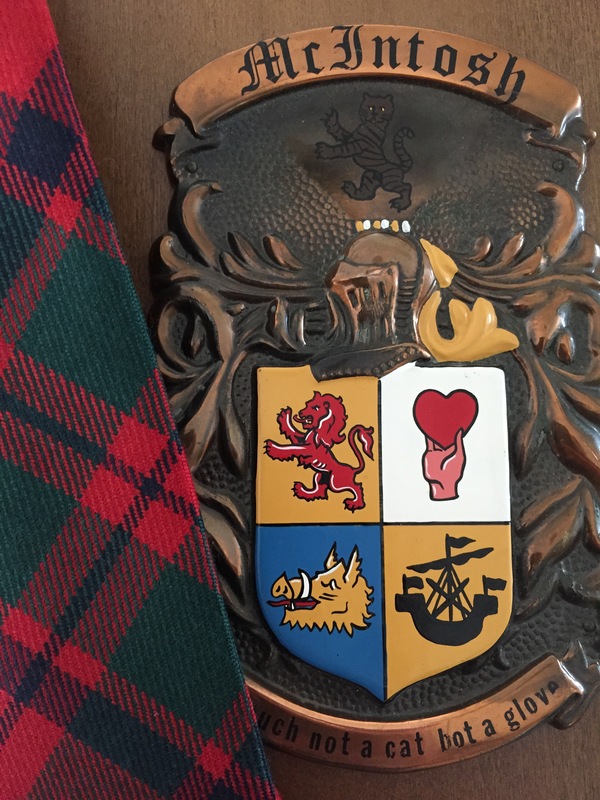 Included were a McIntosh crest and a tie. This is a very special tie. It was given to me by someone I truly love. It is my very own McIntosh plaid tie. ‘Coincidentally’ enough I spoke in sacrament meeting yesterday (two days after receiving the tie) about keeping an eternal perspective and how it helps give us the right motivation. It was only on my way to church as I was thinking about how awesome I looked in my new tie that I truly understood what this tie was all about to me. Yes, it symbolized my grandmother and grandfather, their legacy, their love and teaching, and their examples of discipleship… but the thought was given to me that I should zoom out and look at things from a farther off perspective. That is when it really hit me. Men had been wearing McIntosh plaid for years and years and years before I was born. Good men, like my grandfather, and great grandfather. I was just one person carrying the colors. Family is so important. Names are not always just names. The gospel of Jesus Christ is eternal. My hope now is that someday my children, (especially my first, because of his name) will understand how awesome a responsibility it is to wear McIntosh plaid. 2Grandpa was at my son’s baptism some days after the wedding wearing his McIntosh plaid tie. It meant a great deal to me. I was very happy to see him, and I was very happy to see the tie. I do want to say that, while I have gained a tremendous amount of love and respect for the McIntosh name, it takes nothing away from what it means to me to be an Alexander. I have been compared to other Alexanders my whole life, and I am humbled to be included in the group.